I graduated from Sir Sandford Fleming College in 2013 and received an academic award in pathologies and treatment in the human body. 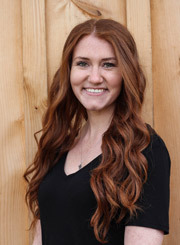 I began working as a Registered Massage Therapist in a Chiropractic clinic in 2013 and joined Carlisle Family Chiropractic in 2018. I have enjoyed working with clients of all ages and fitness levels to assist them on their journeys to wellness. My continuing education courses have included full body facial release techniques and exercises to strengthen the core and back muscles to alleviate back pain. I have also taken training courses using the Dolphin Neurostim device to deliver Microcurrent Point Stimulation (MPS) Therapy for neck and back pain, scar tissue release and Concussion Recovery Therapy. MPS is a type of TENS machine that combines traditional acupuncture principles with modern neurology. It locates active therapeutic points in the body and delivers concentrated microcurrent impulses to relax muscles and calm the nervous system. I am very passionate about a holistic healing approach for the entire body from the inside out. I have worked in both Chiropractic and Spa settings which has helped me combine therapeutic treatments with relaxation techniques to help heal the body and mind. I take pride in helping clients achieve their personal health and wellness goals through hands on treatments and tailored home care regimens of stretching and strengthening exercises. I grew up in Milton and I love to travel and stay active. Over the years I have completed many obstacle course races, half marathons and a full marathon. Registered Massage Therapy is not covered by OHIP but it is included in many Extended Healthcare Plans. Check with yours! Always confirm that your Massage Therapist is Registered in Ontario by visiting www.cmto.com. Call our Carlisle chiropractor office to schedule your personal consultation.